Welcome to Week 48 of Year 8 here at Paint Party Friday! This week random.org chose #5 - June Walker. June shows her work through to this lovely finished painting on her blog. 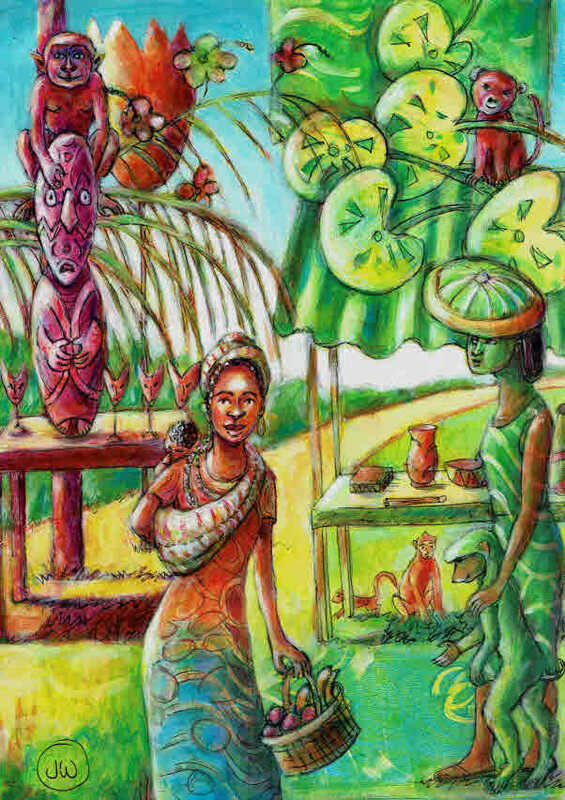 She really makes you think you are visiting a market place on a tropical island! Watch out for that monkey! 😉 Please drop by and check out her steps. Have a fun and colourful paint-filled week! Beautiful painting. Happy PPF everyone! Looking forward to visiting you tomorrow morning. Congrats June, I loved your vibrant market place!! Many thanks for the show by the random generator! Happy PPF all. Absolutely beautiful work, congrats June! I like how June has used a gelli print for the background. Fantastic and beautiful art June! What vibrant and lovely art! Happy PPF! Beautiful detailed work as always June! Thank you so much for your tireless hosting. I swear every time I post I tell myself I will blog weekly with PPF but then sometimes a year goes by. But you're always here when I get back! Also wow, amazing June Walker painting! I totally agree that seeing June's painting transports you to a foreign destination! Lovely work! Happy PPF! Looks like a very lovely market place. It is definitely incredible.